A fruit tree fruits for typically only a few months yet the entire year’s happenings dictate the trees, yield and quality. We as consumers experience mangoes all year these days in North America, thanks to the production zones of Mexico, USA, Ecuador and Peru. So it’s easy to say that at any given time of the year some producer somewhere is practicing empirical agriculture strategies and hoping for yields and quality to outperform expectations. 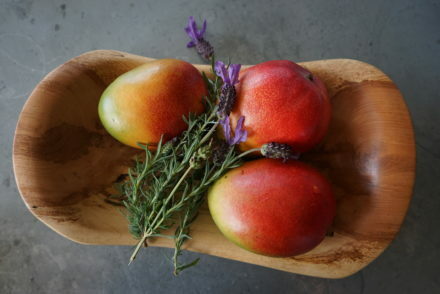 The Mexican mango season ( defined as when the fruits are harvested) typically starts in early Spring, sometimes between February and March, depending on the weather in the off season. The first fruit occurs from the southern regions of Chiapas and Oaxaca and slowly moves up the entire Pacific Rim throughout the summer months, ending in early fall, in the northern Sinaloa region of Los Mochis. Each of these sub-regions of the Mexican mango crop; Chiapas, Oaxaca, Nayarit, Michoacán, Sinaloa, Baja and Los Mochis, all have their own sub-regions, with varying geographies and micro climates as well. This makes the entire Mexican season extremely complex, as you can imagine. The mango orchards either sell to or are owned by a mango pack house who packs and ships the product (the exporter). Each pack house typically packs and ships multiple labels and brands for each producing region and many do not own the majority of the fruit moving through it, they purchase the fruit from smaller producers, who only grow the fruit or provide the service of packing and exporting for smaller producers or an importer. This is a very typical system for most fruit, including avocados where big brands like Calavo and Mission give the impression that they are “ the growers”, but a majority of the the fruit is actually purchased from small producers and packed though one of these pack houses- which may or may not be owned by a big brand. This is typical for most fruit around the world including bananas, apples, and berries and of course mangoes. In the case of Crespo Organic Mangoes, they own and operate their own pack house in Sinaloa which packs and ships all of the fruit from most regions during the Mexican mango season; Nayarit, Michoacán, Baja and Sinaloa. 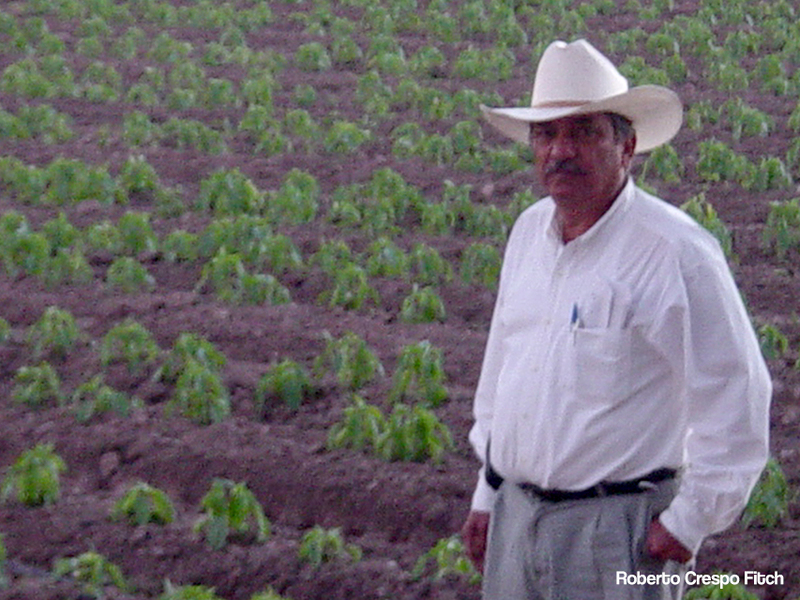 The Crespo’s own thier own orchards in Rosario, Sinaloa -the peak-producing region of Mexico (typically May- August). They also purchase fruit from smaller producers, especially on the conventional side for our RCF conventional programs. Sometimes sizing and varietal needs cannot be met through one particular orchard or group of orchards and thus supplementing fruit from other producers is typical and often , as in our case, these are long term strategic partnership deals vs just simply buying from any producer. In the world of organics where quality and sizing expectations determine programs, it’s essential that the basis are covered pre season, rather than while amidst the season. 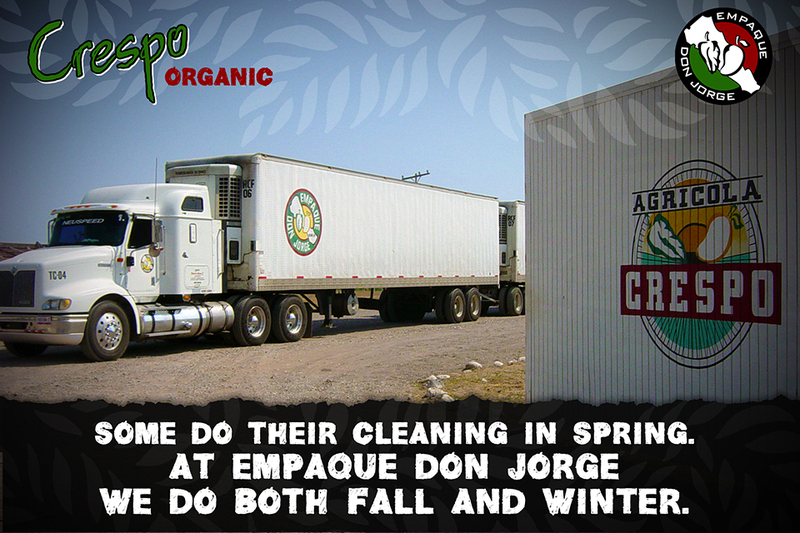 El Grupo Crespo (The Crespo Family) owns and runs Empaque Don Jorge. It was build by family Patriarch Roberto Crespo Fitch in 1971 and has been upgraded and maintained by the Crespo siblings; Malu, Roberto, Jorge and Jose Angel. It is the largest mango pack house in Mexico in terms of possible out put with a capacity 14 truck loads per day. It is the second largest mango pack house in Mexico in terms of actual volumes shipped. The pack house not only packs and ships all of the Crespo Organic and RCF fruit, but it operates as a typical pack house, packing and shipping for other exporters and producers. It’s identity as one of the premier mango pack houses in Mexico gives it a strong national identity as well as the internationally identity as an exporter of mangoes. The early fruit from Chiapas and Oaxaca for the Crespo Organic program is from partner producers in the south. The fruit moves through one of the largest Southern pack houses in Oaxaca in a partnership, allowing the Crespo’s to extend their brand into the early season. Working closely with all partnership producers and packers to ensure the quality and general standards meet the Crespo Organic criteria. This is a year round job, both in Crespo’s own orchards and in the orchards and pack houses of their premier partnerships. In addition to the actual work that gets put in, there is a lot of empirical observation taking place. Growers are of course watching weather closely and how the trees are affected by the weather. They measure rainfall and most importantly the under soil’s ability to take on and hold moisture- this is essential for adequate bloomage and sizable fruit for the upcoming fruit bearing part of the season. Last season (2016 season) the rains arrived late, after bloomage, and caused washing and burning of blooms and an almost non existent crop of early fruit. The el niño last season brought a lack of cold weather as well and thus there was no significant tree stress and thus not a significant bloomage at the onset. 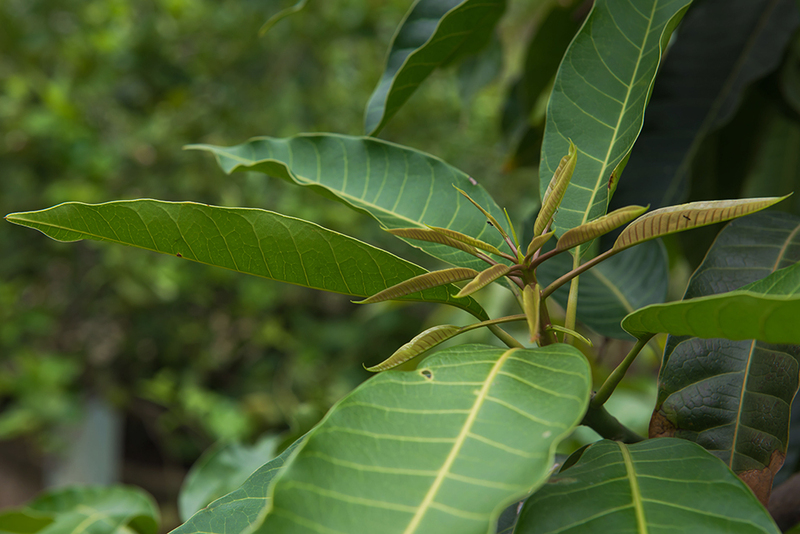 Mango trees need the stress of the cold in order to move through the proper bloomage stage needed for ample fruit production. This years off season arrives so far with ample rains at all the proper times. The orchards in the very south are absorbing a good amount of moisture and the cold has set in for weeks, allowing the bloomage to be on target and hopeful to yields. As the rains move up the Pacific rim, our empirical and scientific knowledge, shows us similar patterns, again giving hope to a good yielding 2017 season. Of course its too soon to tell for sure, the weather over the course of the next few weeks will give more decisive information for the early Chiapas and Oaxacan season and the months ahead for the later producing regions of Nayarit, Sinaloa, Michoacán, Baja and Los Mochis. Of course the work never stops, regardless of weather and the trees natural response to the season of “unpredictable”. The orchards must be setup for success, despite all the weather related, uncontrollable aspects. 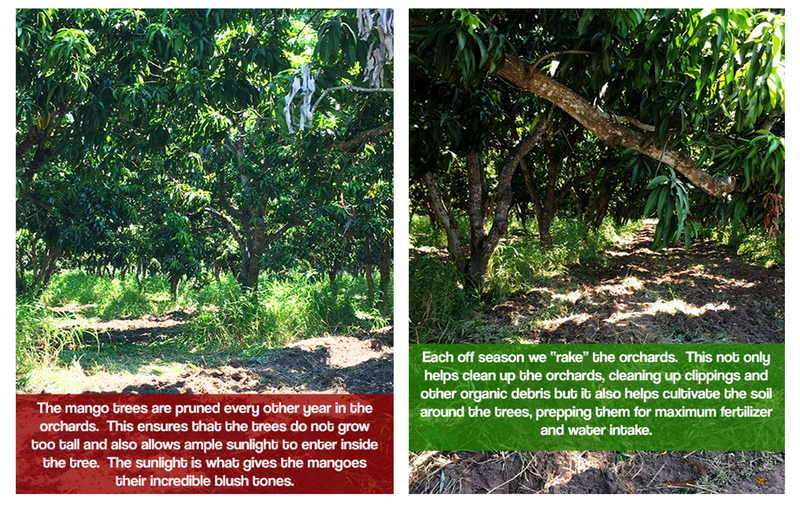 The trees are pruned every other year to ensure the trees don’t grow too tall and that ample sunlight is allowed to enter inside the mango trees canopy. This is essential for the fruit to produce magical blush tones, of which fewer and fewer producers are placing attention to, which is essential for optimal quality, brix development and flavor profile. Each off season the orchards are raked. 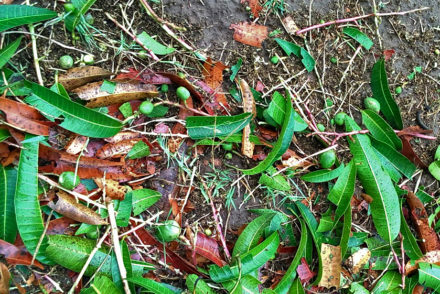 This not only helps keep the orchards clean, cleaning up clippings and other organic debris but it also helps cultivate the soil around the trees, prepping them for maximum fertilizer and water intake and keeps nutrients rich around the root base. Soil health is among the most important aspects of organic agriculture. 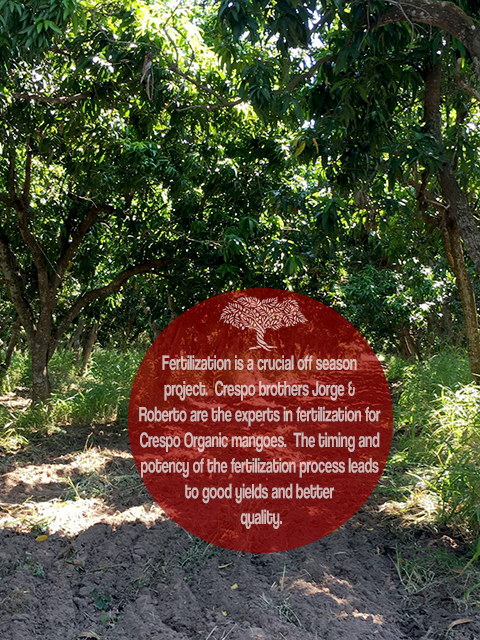 The off season fertilization of orchards is extremely important, making sure the trees have enough nutrients moving through each stage of preparing to and bearing fruit. 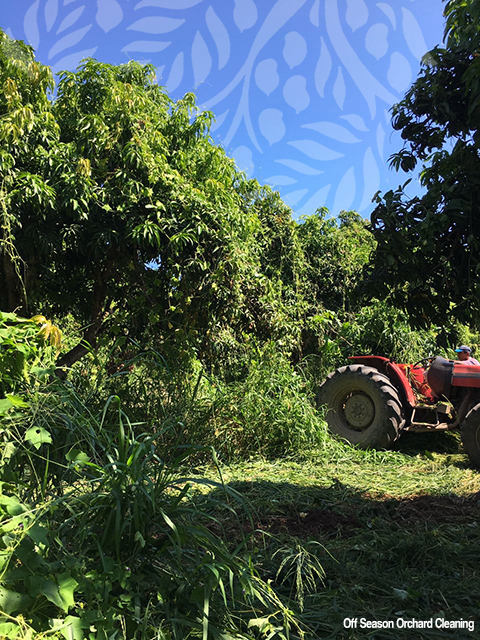 The timing and potency of nutrient intake is directly related to improved yields and premium quality and we take it very seriously doing everything we can to help set our mango orchards up for optimal success. In addition to the orchards requiring full time monitoring and work in the mango off season there is significant work in mango packing house. A Mango pack house is typically open for only 4-5 months of the year but requires 365 days a year attention to keep them running smoothly and safely. Mango pack houses are not nearly as high tech as the pack houses of other fruits, but they are loaded with huge machines and equipment and are generally very large. As food safety requirements progress and improve the pack houses are evolving into pristine “food manufacturing” facilities. Of course it all starts with a good winter deep cleaning, every nook and cranny is scrubbed and polished. A new paint job is given every off season to ensure that that zero oxidation or corrosion occurs on the varies metal parts of the machinery and plant infrastructure, like racking and packing lines. In this particular off season the Crespo’s begin the process of replacing all metal with stainless steel in Empaque Don Jorge. The stainless steel will not corrode and will eliminate the yearly painting of the metal allowing the company to advance beyond the norm in food safety systems. Of course the maintenance of machinery is crucial for pack house success. During peak season the lines barely stop so machinery must be in tip top shape prior to season start date. Packing equipment, like sorters and washers and conveyers, as well as tanks, chain and hoppers are taken apart, cleaned, fixed or replaced. In some cases stored until the season begins. Cooling equipment is a big priority as well. 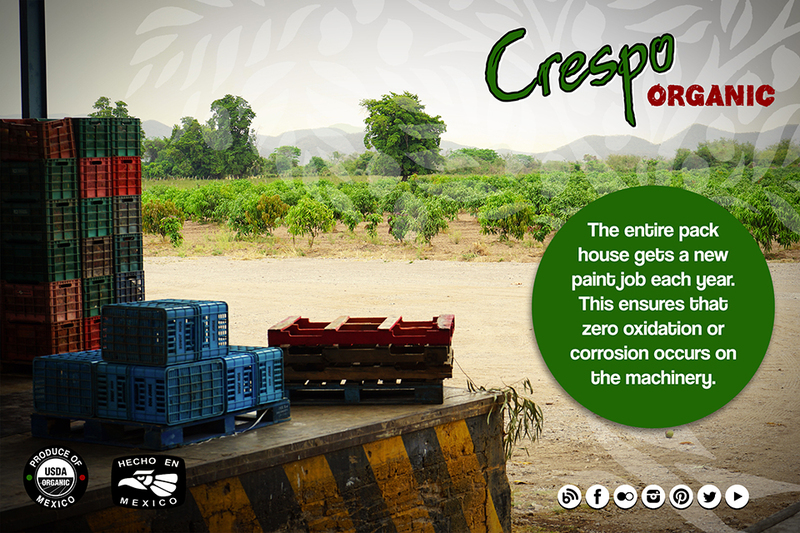 Crespo Organic mangoes operates in three pack houses in Mexico, all of which have the largest square feet of cold storage and cooling facilities of each region. Keeping the cooling systems working in peak season, which is HOT, means there is a lot of refrigeration work needed to be done in the off season. There is a significant number of laborers who do not work in the off season, pickers, packers, drivers, quality control etc. But the important work done by those that do, helps drive the quality of the seasons success by optimizing efficiency to the entire operation. This means constantly evaluating what can be done better and utilizing technology to update all systems, whether that be new GPS truck trackers for understanding logistical problems with poor cell reception during long border delays in customs, where drivers cannot access their cell phones for several hours at a time, or new messaging services where field scouts can communicate directly – with live photos, with anyone on the company with a touch of a button. Taking time out to analyze the process is something that folks with seasonal production are lucky to have. Most do not utilize this time to reflect, and change- Crespo Organic does and this is one of the many reasons we continue to forge ahead achieving customer satisfaction. So as the weather is monitored, the show must go on, especially when there is no fruit on the trees. The work behind the season, along with the weather, dictates the outcome of the season. 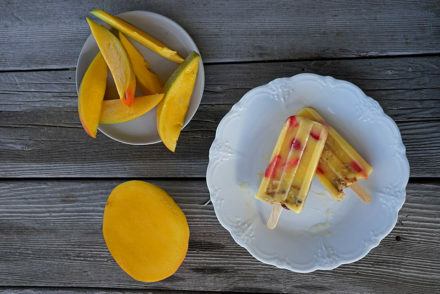 So next time you bite into a juicy mango, think about the work behind the season! 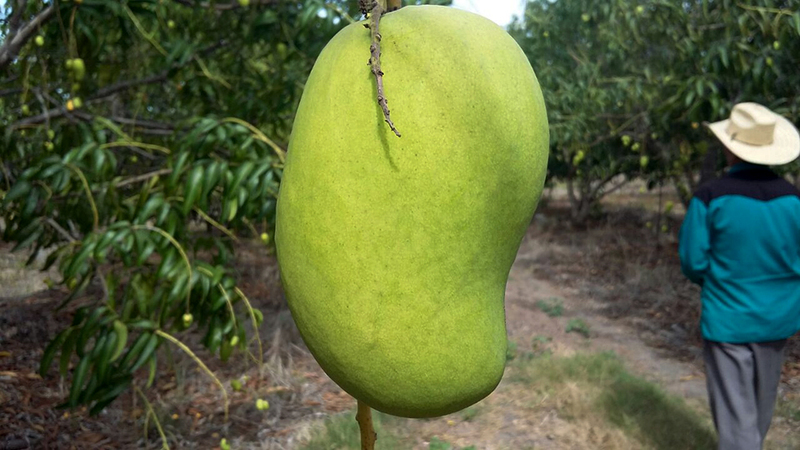 Stay tuned for crop updates as we progress closer to the fruit bearing part of the season! Under The Mango Tree is a sweet spot, where I, a long time mango industry crackerjack, share everything I know. A place to find mango centric, agricultural, food and culture knowledge and a few juicy industry secrets and lies.